Tunku Abdul Rahman Park, Kota Kinabalu: It was with great pleasure that Downbelow recently took a group from Sabah Parks under their wing to equip them with a variety of skills. Often collaborating with Sabah Parks on Project AWARE and illegal net removal programs, it was fun to welcome them into the diving fold for a change. The 6 Sabah Parks staffers spent a few days at Downbelow’s PADI 5 Star IDC Centre on Gaya Island, which is co-located with the Sabah Park HQ for their Tunku Abdul Rahman Park operations. 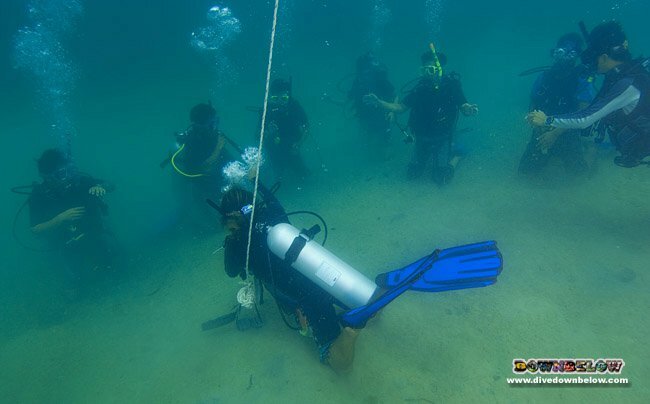 The program, customised for the Sabah Parks staff, consisted of 6 Open Water SCUBA Diver, 5 Advanced Open Water Diver and 6 Emergency First Responder courses. From course work at the dive centre, to skills training in the adjacent lagoon and practical exercises on CPR dummies, the group took the learning curve in their stride and smiled their way through all 3 programs. After a few days, some hard work and lots of fun, 6 Advanced Open Water and Emergency First Responder trained Sabah Park staffers emerged to tackle their jobs with new insight and skills. We look forward to welcoming them back for plenty of diving and more training soon. Check out some more pictures from the Sabah Parks group in the album on our Facebook page.